Building a base for a DIY Garage Kit. Here at storage sheds direct many folks ask us what kind of base should I place my garage kit on. Well for more reasons than one, the simple answer is concrete. Why concrete? 1) Concrete provides an excellent floor for placing a vehicle on. 2) It is clean and dirt free. 3) When properly laid it provides a level foundation to place your garage kit on which makes it much easier when it comes to erecting your building and placing equipment on etc. 4) You can screw down your building to it to and seal to concrete. This prevents rain penetration and will keep your contents dry. 5) Bolting your building to concrete will ensure it does not blow away in a storm. So how do I build a concrete base? The first job will be to assemble a timber template to suit the foot print of your building. A rule of thumb is to make it 6 inches bigger than your shed. This will allow for fine tuning shed position later if needed. Ideally use 2×4 for this job. When assembled it will be important to make sure it is completely square. You check this by measuring form corner to corner diagonally. When both diagonals are equal then your template is square. You can place a few temporary laths at 45 degrees on the corners to maintain the square and remove later. Wooden template for concrete base. Next it will be necessary to position and level your template. Once you have decided the exact position you will need to take stock of the ground level. Try and set the template on level ground if possible. This will make the job much easier. It may be necessary to dig away any heights or fill in any hallows. Try and aim to have your concrete slab no more than 4 inches think all over. This will make it easier to quantify the amount of concrete needed. To secure your template you can use some wooden pegs all the way around the perimeter on the outside. Drive the pegs into the ground always making sure that you maintain the square and level at all times. You can temporary screw the pegs to the template when pegs are driven into the ground. This will provide a solid template when it comes to pouring concrete. The last thing you want is the template moving around when you are pouring concrete. So the more pegs you place around the perimeter the betterNext you will need to quantify the amount of concrete needed. This is a simple formula which is derived by length x width x depth. So let’s say our slab is 10’ x 20’ and depth will be 4 inches. 10×20 = 200sq feet. To bring it to sq. yards divide by 9. So 200 / 9 = 22.2 sq. yards. 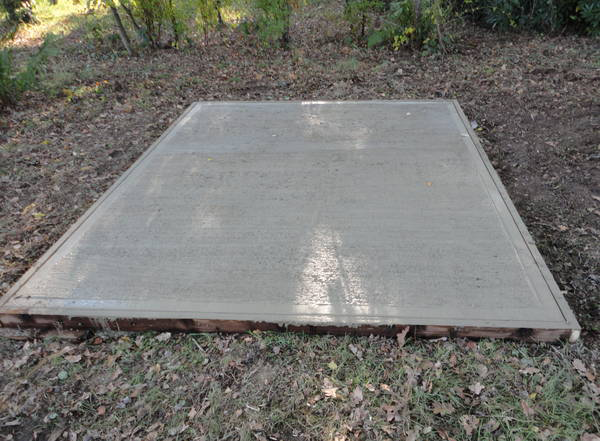 This is the floor area for a 10×20 concrete base. Two cubic yards will give us 18 sq. yards of coverage. But we need 22.2 sq. yards approximately, so another half a cubic yard will complete the job give or take a bit for waste. Total needed will be 2.5 cubic yards to cover 22.2 sq. meters of base. Finally show time. Depending on access you may need to barrow in the concrete or use some other method to get it to the location. It helps to have at least two people for this job if not more as concrete has a limited working time. 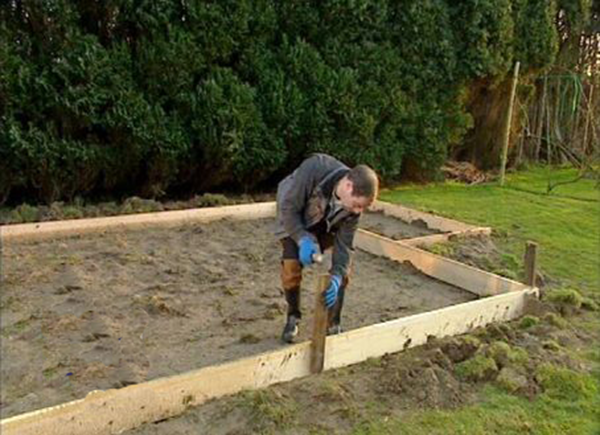 Tip: spread concrete evenly and using a long straight edge tamp is down and level it as you go. When you are happy with it come back later and trowel it off to get a smooth finish. When finished leave for a few days before removing template and you are ready to start building your garage kit. Storage Sheds Direct are a nationwide supplier and storage building consultant and provider of DIY Garage Kits form top US companies like Arrow, Duramax, Rhino Shelters and Shelter Logic. We offer free shipping throughout the United States. This entry was posted in How to... on February 10, 2014 by gorman101.